Real Madrid did their job at the Bernabéu after beating APOEL by 5-2, with Cristiano Ronaldo extending his good form by scoring two more goals in the competition. The Merengues got through to the semi-finals, with an expressive aggregate result of 8-2 and are now set to measure strengths with Bayern Munich. The German side will be Real Madrid's last obstacle in their journey to reach the UEFA Champions League final, on May 21st of 2012. No surprises at the Bernabéu, as Real Madrid crushed APOEL by 5-2, with a new brace from Cristiano Ronaldo. The final 8-2 aggregate favorable to the Merengues, mirrors the huge differences between the two sides and allows José Mourinho's men to embrace the upcoming semi-finals with a special motivation boost. Cristiano Ronaldo (2), Kaká, Callejón and Angel Di María, all scored against APOEL this Wednesday night and the Merengues can now get mentally prepared for a classic match-up against Bayern Munich, in the competition's semi-finals. The 1st leg is scheduled for the 17th of April in Munich, while the 2nd leg will take place at the Santiago Bernabéu, in the 25th of April. The Merengues started the game at full throttle, leaving no room to thoughts of a potential over-relaxation which would turn APOEL's task easier than it was on the 1st leg, where they were beat by 0-3 in Cyprus. With goalscoring chances taking place one after another, the opener appeared naturally before the first half an hour. Marcelo crossed a ball from the left which Gonzalo Higuaín failed to make contact, but would end up falling into the far post where Cristiano Ronaldo, once more, showed his killer instinct and scored in a somewhat unorthodox way, after deflecting the ball with his right knee. The 2-0 took place on the 37th minute, in a vintage moment from Ricardo Kaká. Cristiano Ronaldo and Marcelo started the play on the left wing, with the Portuguese player passing the ball to Kaká, who had been left with plenty of space on the edge of the area. The Brazilian didn't think twice, and made a terrific curled shot form outside the area, scoring one of his best goals for Real Madrid this season. José Mourinho was certainly one happy man at that point, since his players were showing a great attitude despite having the qualification already virtually secured. Half-time arrived with the 2-0 on the scoreline and predictably, Real Madrid slowed the pace for the remaining 45 minutes. José Mourinho changed a few things and started by giving some rest to Marcelo on a first stage, as well as Higuaín later on, but still before the 55th minute. The Merengues lost some of the control they had during the 1st half and APOEL capitalized it near the 67th minute, in a beautiful counter-attack play that caught Altintop poorly positioned, and which alllowed Manduca to bury the ball into the net. However, less than 10 minutes later Real Madrid responded and in what a way! Cristiano Ronaldo scored his 3rd goal from a free-kick for Real Madrid this season (2 in the UEFA Champions League and 1 in La Liga), in a perfect strike near the edge of the penalty area. The ball was still slightly touched by APOEL's goalkeeper, Pardo, but there wasn't much he could do, since Ronaldo's shot had been strong and precise. Close to the 80th minute, Nuri Sahin had a great assist for Callejón, who exploited a lot of space granted by APOEL's defense backline, just before driving inside and scoring from a right-foot low shot. 4-1 on the scoreboard and everything was being too easy for Real Madrid, even when not pushing forward with much intensity. APOEL would still reduce the Merengues lead into 2 goals, as they were granted a penalty-kick in the 82th minute, after an unnecessary sliding tackle from Altintop inside the area. Esteban Solari called upon himself the responsability of taking the penalty-kick and didn't seem to have problems to beat Iker Casillas. This has actually been the 1st penalty-kick ruled against Real Madrid this season, in all competitions. But the game wouldn't end without Angel Di María also leaving his mark on the game. The Argentinian returned from injury and scored a brilliant goal from a chip, still outside the area. Final result was set with the 5-2 to Real Madrid and the Merengues will now face Bayern Munich in the UEFA Champions League semi-finals, which will start in two weeks. Barcelona and Chelsea will fight for the remaining spot in the Munich Final, scheduled for the 19th of May 2012. 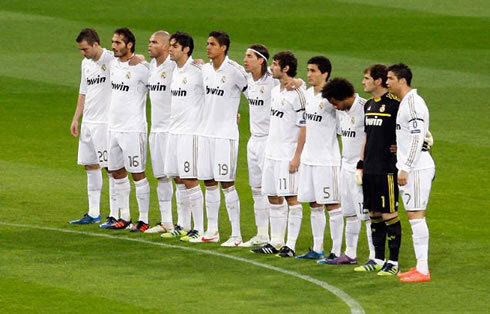 Real Madrid next game is for La Liga, against Osasuna, this next Saturday (31-03-2012). In the meanwhile, you can watch Chelsea vs Wigan, Hannover vs Atletico Madrid, Valencia vs AZ Alkmaar and Sunderland vs Tottenham, all from our football live streams section. Cristiano Ronaldo is expected to be a starter when Real Madrid hosts Valencia, this next Sunday.